Do you want to know what kinds of questions are found on the OLSAT® nonverbal section, and what skills are measured by these questions? Would you like some test prep strategies on how to prepare for specific OLSAT nonverbal questions and access some sample questions to help your child get ready for test day? In this article, we respond to these common concerns, as well as provide additional information that will help you know what to expect on the OLSAT non-verbal section. What Question Types Are on the OLSAT® Non-Verbal Section? The OLSAT® is divided into two sections:verbal and nonverbal. The purpose of these questions is to measure a student’s ability to reason their way through non-language based scenarios. These questions are in a visual format, incorporating pictures instead of words. Students will be expected to find the relationship between elements and/or objects in a pattern, to predict and create what the next level of the pattern will look like, and generalize the rules they discover. Picture Analogy A-C In these questions, students are presented with a 4-box matrix and must identify a relationship between two objects in the first row. The student needs to apply this rule to the second row and choose which object - from the answer choices - completes this second row relationship in the same way. Picture Series A In these questions, students must examine a sequence of objects and identify/predict the object that comes next in the sequence according to the underlying pattern. The purpose of these questions is to measure a student’s ability to reason their way through non-language based scenarios. These questions take a more visual format than the verbal questions, incorporating geometric figures instead of words. Students will be expected to find the relationship between numbers or objects in a pattern, to predict and create what the next level of the pattern will look like, and generalize the rules they discover. What Skills Are Assessed by OLSAT Non-Verbal Questions? Non-verbal questions measure a student's ability to reason her way through non-language based scenarios. These questions take a more visual format, and students answer questions based on information and reasoning from pictures rather than as a result of listening to and reasoning from verbal questions asked by a test administrator. 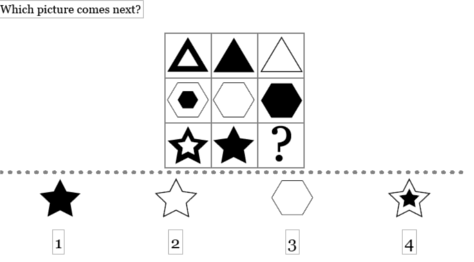 To answer these questions, a student needs to be able to find the relationship between objects in a pattern, to predict what the next level of the pattern will look like, and generalize the rules he discovers. What are the top test prep strategies to solve non-verbal Questions? For more information on the non-verbal section, including teaching tips and sample questions of specific non-verbal question types, click on one of the links below. Get started preparing for the OLSAT now by downloading free OLSAT practice questions. Just click the blue button below. If you think you need more information and guidance about the OLSAT, check out our in-depth article on the test. You can also learn more about the verbal section of the OLSAT. Also, learn everything you need to know about other tests that measure a child’s potential to do well in school, such as the NNAT2.